WA – What is the “in a nutshell explanation” of Cengage’s business? WR – We play in a couple of areas: We are one of largest providers of curriculum for post-secondary ed. We compete in most major markets around the world including North America. We are the number one provider of library reference materials worldwide: academic libraries, school libraries… In English language training, we are one of largest players globally. We are helping adults and others learn English as a second language. We partner with National Geographic, under their National Geographic Education brand. As a company, we have been in the throes of going through the shift to digital. About 30% of our $2 billion in revenues is tied to digital solutions. WA – Tell us about Cengage’s overall strategy these days? WR – There are two prongs to our strategy. Particularly in the post secondary part of our business, it has largely been a textbook business. Prong 1 is to build and offer customers high-quality, digital solutions that are really focused on helping faculty engage students better and drive better outcomes online and on ground… The second part of our strategy is focused on wrapping that with services. In the past, our business was transactional based – selling books to distributors. As we move into the digital world, using a digital platform to deliver learning… allows us to measure how students are doing, showing faculty how students are doing, which parts they understand or are struggling with. As we move from print to digital, ultimately, we will help improve the workflow of the students and faculty. WA – Please explain more about how you are shifting from print to digital and this product MindTap? WR – The way our business and industry has evolved, it used to be all books. In the last 5-10 years, it is all solutions… Where we’re going, we just launched a next generation learning solution called MindTap. It’s the unification of all the different solutions… Where we’re going with MindTap is to integrate all of that into a unified software framework. We’re mashing up really good pedagogy that is instructor-tested to create a simple, unified platform that is device agnostic, browser-based. (It incorporates quizzes, tests, study materials, sharing functions, social media functions, apps as well as being an e-book). Students will have at their fingertips everything they need to be successful. The other piece to MindTap that is really interesting and unique, it is the first of its kind with a third-party app model. It will allow third-party developers to build apps that are unique and integrated into MindTap for a particular course. We’ve gone to market recently with MindTap. We have a number of partners we announced – tutor software and others. If students are stuck on a chapter or problem set, they can get access to a tutoring service directly where they are in that course. WA – How are you managing the development work at this point? WR – We have built a world-class development team internally. In the last two years, we have hired 200 people on the development side to build all of this… We ended up bringing a lot of this expertise in-house because it is part and parcel to what we are doing going forward. We have a U.S. team but also off-shore resources in places like Russia and India. WA – Can you give us an outlook on the education industry right now in the middle of this ongoing recession? WR – At the most macro level, education we believe is really the signature industry of the century. The linkage between education and salary, job creation, societal value – that relationship has gotten stronger and stronger every decade. Around the world, we are seeing a macro trend: While GDP grows, education helps drive that. In emerging markets like Asia or Brazil, we are seeing tremendous growth. We believe that relationship in the economy through ups and downs will persist… The other dynamic that has been true in North America for 100 years now is that education does tend to exhibit some element of counter cyclicality. When the economy goes south, more people go back to school to retool themselves. When the economy went into a recession, enrollment growth just shot up. Two-year schools were up 10% and 4-year schools were up in the single digits. When the economy improved a bit, that enrollment growth has also moderated. We are not officially in a recession now, unemployment is hanging in the 9 % range. As long as that is stable, enrollments are growing at a low single digit pace. As we look forward, we believe that education is a tremendously interesting sector and it’s really driven by the relationship to adding value to economies around the world including the U.S. There are ups and downs in the enrollment page. That is driven by unemployment rates we see. Our outlook is that, for the next 2-3 years, we are expecting 1-2% enrollment growth in North America. WA – And digital revenues are a big part of that? WR – This is really one of the last multi-billion dollar industry sectors that was predominantly print. In the last few years you are seeing a tipping point where digital revenues are starting to grow. Just in higher education alone, we are about 21% digital. WA – Can you give us a breakdown of for-profit and non-profits and how those customers are behaving right now? WR – We do serve non- and for-profits as a company in almost all schools. Eight to 10% of our enrollment base now goes to proprietary schools and the rest to the non-profit schools. That’s not dissimilar to our business mix. I would say it’s not dramatically different. The biggest difference is between the proprietary schools and non-profits. They don’t have the academic freedom issues. Most of them have a chief academic officer, who makes decisions and rolls them out across their campuses. In the non-profit world, the individual faculty choice model is still the predominant model you see out there. A faculty member in chemistry or physics makes an individual decision about an individual course. That’s still the biggest difference between the two. The proprietary may be slightly behind the non-profits in the category of homework solutions. The proprietaries are probably slightly ahead in converting wholesale content from print to digital for the use of something like an e-book. Many of the proprietary schools are going to the conversion from textbook to e-book right now. That’s largely because of centralized buying. WA – What do the rise of gadgets like the iPad and tablet mean for the classroom and studying? WR – Our strategy, as it relates to mobility and tablets, is we want to be inter operable. There are a couple of dimensions to inter operable. We want to be inter operable across the mobile platform. Apple or Amazon Kindle. We also want to be operable on large systems that reside on campuses – the LMS or CMS. MindTap can run on any device. Flash cards are an automated piece of the software. 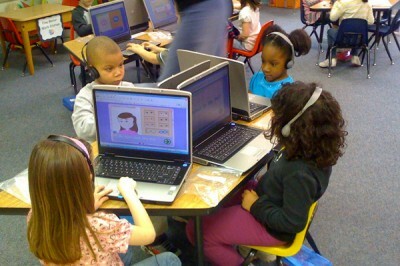 They can use slates, Macs and PCs. We are not hitching our wagon to any one device. We are trying to take an approach that is agnostic so we don’t have to bet on a single device. We do think the browser is the way to take advantage of that. WA – Are your textbooks all digitized now? WR – The battle we fought a few years ago was digitizing our textbooks. That’s done. The progression with core textbooks now is to improve the experience so we are moving from PDFs to XML based and serving up more interactive assets and multimedia. The real heavy lifting now is migrating from core solutions to having a software framework. Digitizing the reading part is done. For us, the real heavy lift is on the interactive piece – the homework solution that students find satisfying. It captures a grade and delivers it to the faculty. With digital, we have tremendous potential to re-imagine content. We do have thousands of titles. The textbooks are built around a linear structure or table of contents. We can now re-conceive how a course is taught. We do have to focus on a sound pedagogy. We do have the ability to change how we do things in a digital world. WA - What will happen to LMS providers like Blackboard? Will we see Google, IBM and others get involved in this space? Will you guys get into this business? WR – We’re not a competitor for them. Our strategy with the LMS is to be inter operable with all of the providers, Blackboard and the others. Our goal was to have an integration framework. So our customers don’t have to deal with all of it. Ultimately, the LMS providers in the US are very penetrated. 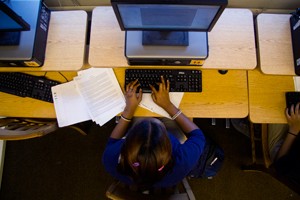 Most schools have LMS. They will continue to evolve. Moodle has gotten some traction. Blackboard continues to be a player. WA – Who do you see as your competitors then? WR - Pearson and McGraw Hill and Oxford. McGraw Hill had an activist who made a lot of noise. The board recently approved a break up of McGraw into an education division and put S & P into another division. WA – What’s your view on for-profit learning and online learning in Europe and other parts of the world? WR – Brazil has an increasing for-profit network. There are definitely other countries who have taken advantage of a for-profit education model. People talk about education globally. While there is a global demand, it tends to be a regional business still. As they [for-profits] look to scale outside the U.S., they have to contend with different regional issues, socio-economic issues. We are in the early days of seeing it sort itself out. What works in England doesn’t work in Germany necessarily. WA – What’s your take on the new for-profit college rules the Department of Education is establishing? WR – We felt the strong enrollment growth when it was growing 15 to 20%. That helped our business. In the last year, we have seen the enrollment growth wane considerably. If you look at school starts, that number is somewhere between down and flat. That absolutely affects us. When that number is flat we tend to be flat… This has been a big speed bump for the for-profits. There is a big mix. There were for profits that were buttoned up. Others operated on the edge. Now that the government has clarified the rules, it will just eliminate the uncertainty. The basic value proposition of the for profits will persist… They offer a slightly different value proposition that non-profits can’t offer. I do think the for profits will experience more competition. I believe that market will continue to grow. WA – Geographically, where are you most interested to grow outside the U.S.? WR – We’re about 85% North America, 15% rest of the world. Outside of North America, our EMEA is the biggest piece of pie followed by Latin America and Asia. We are really focused on a lot of the emerging markets where there is an incredible thirst for ESL. We have the number one selling product in China focused around ESL. We are in every major Asian economy and Latin American economy at this point. We are really looking to those areas plus the Middle East for growth right now. The ESL product is called “Go for It.” In the Middle East, it’s through colleges. As education becomes increasingly important and schools are opening up and growing, that’s fueling our business to provide those schools with curriculum. WA – What kinds of acquisitions have you just done and what are you looking at now? WR – We will continue to invest organically. Our acquisitions will focus on textbook title areas, new areas. The second area is tech and services. As we need to move into new agencies and technology capabilities. The third is around our English language training globally. If you look at a couple of our big acquisitions in recent years, we recently acquired Hampton Brown under National Geographic. It is a pretty interesting deal. It got us two things – Hampton Brown is the number two English language training provider in the world. We have a stronger position now. We have the ability to use the National Geographic brand around the world in education – English language training, post secondary and others. As we extend our business outside the U.S., we will be leveraging that around the world. We just finished that deal. We closed it this summer. We are off to the races. Another deal we closed in the last couple of years is we bought the college textbook publishing arm of Houghton Mifflin. It was primarily a post secondary publisher. They had a complimentary area to our list. It helped fill in where we had gaps. Note To Readers: What Question would you pose to Rieders. Email them to us at Paul@WiredAcademic.com and we will ask them in a follow up interview.